Your TV room is likely the entertainment center of your household, a place where family and friends spend quality time. Because this space is so commonly used, you don’t want your television to seem like a gadget that gets in the way of your room’s look. Instead, you can have an eye-catching addition to your living room, family room, basement, or home office. 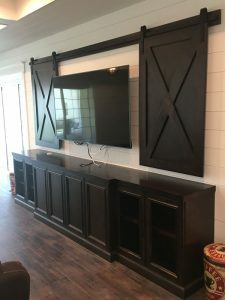 Custom TV stands do more than just support televisions. Their handcrafted designs reflect the individuality of your style. If you have ever assembled a prefabricated TV stand, you have probably been frustrated by missing or damaged parts and confusing instructions. You know that measurements aren’t always accurate, and materials aren’t always the best quality. At Sunset Custom Cabinetry & Woodwork, we never want to you suffer from cookie-cutter models and poor construction. Our expert craftsmen build custom TV stands to fit any size or shape of room. With many options for materials and finish, our TV stands update and enhance your entertainment space to accommodate every type of media. Whether you want a classic or modern look, we work with you on every step of the process, from design and build to the finished product. Custom TV stands by Sunset Custom Cabinetry & Woodwork provide the best solutions to storage and presentation. Entertainment centers are more than just places to hold televisions. Your entertainment center is the focal point of your room. It’s where you organize your belongings and display your screen. Our entertainment centers provide storage for a wide range of media in a style that’s limited only by your imagination. With fully custom builds and finishes, our entertainment centers live up to their name, as they beautify your room. Our skilled team transforms TV stands into fully functional entertainment centers. Whether you have a modern flat-screen television or an antique piece to show off, our TV consoles are custom-made to fit televisions and other devices, like speakers or media players. TV consoles emphasize the entertainment capabilities of your space, while adding to the charm and décor of your room. Our TV consoles can support your television at any height for an optimal viewing experience. TV centers combine form and function, adding to the style of your room while providing the utility for organizing your media. With options for built-in lighting and endless choices of cabinetry, shelving, and materials, our TV centers frame the most important room in your home. Our experts can help you organize your entertainment in a way you never thought possible. Whether you have classic, contemporary, or modern taste, our experienced team builds customized TV tables to work with any setting. If your entertainment room is already designed, we can match the color and style of your existing furniture. If you’re looking to update, we will design a TV table that acts as a style guide for your future décor. TV tables should be just as beautiful or sleek as the rest of your furniture, and you can only get that quality with a custom build. Media cabinets provide an array of storage and organizational options to suit your needs. Whether you keep books, digital media, plants, or other decorations on your shelves, media cabinets help you organize them beautifully. With options for glass or wood cabinets, choose whether to display what you store or have your cabinetry itself become the display. Unlike prefabricated versions that you buy from a store, our custom media cabinets reflect every detail of your choice. With options for static or adjustable shelving, your display can evolve and change when you want it to. From family rooms to home offices, many spaces require media centers. We build custom furniture to complement any specification of size or style. Our media centers can match the design of your space, taking size and function into consideration, while adding to the look and feel of the room. With options for open and closed storage, our media centers are solutions for the different ways you wish to display or conceal household items. Depending on the style of your room, you may not want to display your television all the time. 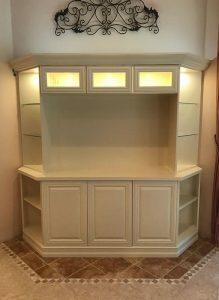 TV cabinets are a clever and tasteful solution to concealing your TV while emphasizing the beauty of your custom built unit. As experts in custom building, we understand how room dimensions require specific and detailed work. Our TV console tables do not come from packages. If you’re not sure how to choose an option for your unit, let our experienced team walk you through the entire process. Building the best TV console tables for our customers is our first priority. What happens if you don’t want your television in the center of your room? What if you don’t have the free wall space? Corner TV Cabinets are cleverly designed for interior appeal, adding charm to a more compact and versatile style. Wall-mounted televisions are a popular style in many homes. Our custom TV wall units work seamlessly with your television’s display. Complemented by a variety of shelving and storage options, we will design a unit that provides visual appeal and functionality. From the stages of planning, design, build, and installation, our expert team is ready to serve you. 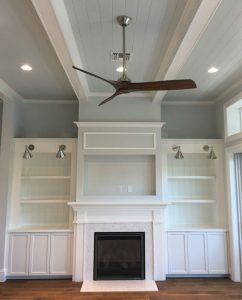 Whether you’re enjoying the game with your friends, having movie night with your family, or relaxing by yourself on a lazy afternoon, at Sunset Custom Cabinetry & Woodwork we will make your entertainment experience truly stand out with Custom TV Stands. Call us today to request a quote, or contact us via email for more information about our services.